The three works that make up Brainstrips are, like much of Bigelow's work, highly-concentrated, intricately-designed visual and audio experiences, often using assets culled from the internet. Just when these works appear to veer into parody or outright whimsy, questions of some genuine gravity are broached which anchor the pieces in some very serious questions of philosophy, art and society. You are never quite sure which of these hot-button topics Bigelow is aiming for at first. "Higher Math," one discovers, employs the tropes of numbers and equations as a foil for the emotions, while "Science for Idiots" is more about the politics of science - who are the "idiots"? - than science itself. "Deep Philosophical Questions" makes of the comic book panel a stand-in for all structural frames as they effect/affect our artistic and narrative perceptions. Author description: Brainstrips, a series of comic strips for the web, explores key concepts in philosophy, science, and math. Each work is created in Flash and includes text, animations, audio, and video. "Deep Philosophical Questions" (2008), answers six important questions that slip between the cracks of serious philosophy, into a place where logic and pedantry have no play. 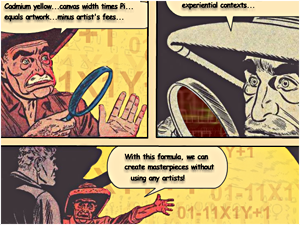 This work uses copyright-free comic strips from the Golden Age of Comics (American comic books created in the 1930s and 1940s). The strips have been re-colored and digitally edited to enhance their clarity and to accommodate new dialog boxes and Flash animations. "Science For Idiots" (2009), explains some of the greatest science puzzles of our time. This work uses comics and clipart images that have been digitally edited and then animated to create a multimedia story event for the viewer. Sound is also an integral part of the story, and it has been layered into each segment of the piece. The final result is a dynamic visual and auditory experience for the reader, and a closer look at the potential within animated strips on the web. "Higher Math" (2009), examines key concepts in math: addition, subtraction, irrational numbers, multiplication, geometry, and the Googolplex. Each concept has a human element, and their commonality, a bridge between math and ethics. These three works use images, video, and audio files acquired online, and modified by the artist. A credits page is included in the work. Instructions: Adobe Flash plugin required. Previous publication: Brainstrips was published in Blackbird 8:2 (Fall 2009). You can find this story online at http://www.blackbird.vcu.edu or at http://www.brainstrips.com.